Just replaced your old iPhone with a new Android phone like Samsung Galaxy S8/S8+ or Note 8? And don’t know how to transfer contacts from your old phone to the new phone quickly? Take it easy. Simply following the three ways below to seek out how to transfer contacts from iPhone to Android in few minutes. Part 3. Copy Contacts from iPhone to Android via iCloud? 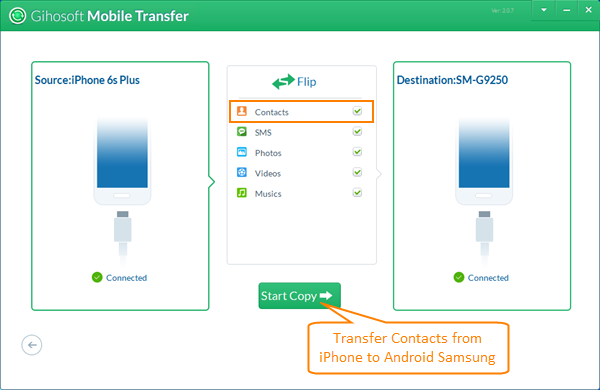 You can transfer iPhone contacts to Android via third-party tools such as Gihosoft Mobile Transfer. This software can help you transfer contacts, text messages, music, photos and videos from iPhone to Android phones such as Samsung Galaxy S8/S8+/Note 8, HTC, LG, Sony, Motorola, Google, Huawei, OnePlus and more. Mobile Phone Transfer allows you to transfer 10 contacts from iPhone to Android mobile phones for free. Once you registered the software, you can transfer different files such as contacts, SMS, photos, videos and music from iPhone to any other Android smartphones. Run the iPhone to Android Transfer tool and tap “Phone to Phone” section. Then connect both your old iPhone and new Android phone like Samsung Galaxy S8/Note 8 to your computer via USB cables. If your mobile phones cannot be identified, please retry again. Tick “Contacts” and other files that you need to transfer from iPhone to the new Android phone. Hit “Start Copy” button to begin the process of transferring contacts from iPhone to Android. All the iPhone contact information such as profile photos, name, title, company, Email and etc. will be transferred to the destination Android phone without any loss. Note: By following the above steps, you can copy contacts from iPhone to any other Android phones including Google Nexus, HTC, LG, Sony, Huawei and more. Also, you can transfer text messages from iPhone to Samsung Galaxy S7/S8. Part 2. Move Contacts from iPhone to Android via iTunes? Connect iPhone to the computer via USB cable, then click the phone icon to open summary settings. Go to “Info” option, tick “Sync Contacts with” and choose Google Contacts from the drop-down menu list. Please enter Google account username and password, then click “OK” to authorize iTunes to begin syncing iPhone contacts with Google. Take out your new Android phone to add Google account: Settings -> Accounts -> Add account, Google. Please allow Google to sync contacts with your new Android phone. Apart from the two methods mentioned above, you can also copy contacts from iPhone to Android via iCloud. Enable iCloud on your iPhone: go to Settings -> iCloud -> enter iCloud account information to sign in. Connect iPhone to the internet, then turn on Contacts to sync iPhone contacts with iCloud server. Export iPhone contacts to a VCF file from iCloud, then copy the VCF file to Android phone storage via USB. Import contacts from VCF file to the Android phone. Open Android phone, go to Contacts -> More -> Import/Export contacts -> Import from VCF file. There are three different ways to transfer contacts from iPhone to Android, which one do you prefer? If you find it’s difficult to make a decision, then Gihosoft Mobile Transfer is recommended to you! This program can not only permit you to transfer data from iPhone to Android, but also allow you to backup your phone data to the computer and restore data from previous backup files whenever you need. How to Transfer Contacts from Old iPhone to New iPhone X/8/8 Plus?